Breeders Cup - Once Again Lame - Peter Land (Profile: LinkedIn) is up to his old tipss again, thinking that horse racing is on par with, oh, say, the NBA, where he toiled for 5 years. We first reported back in August (Breeders Cup - Coming Up Lame, 8/11/08) that the Breeders Cup was trying to restrict images that were shot there. Now, their latest "Credential Use Conditions" paperwork comes over the transom for the races, which take place October 24th and 25th. This credential is issued for the sole purpose of providing facility access to an individual (“Bearer”) who is working on an assignment for a legitimate news organization or an authorized provider of event-related services (as employee, agent or designated representative) for events, activities, and interviews relating to the 2008 Breeders’ Cup World Championships (collectively hereinafter, the “Event”), and Bearer hereby represents that he or she is attending the Event solely for such purpose. This credential is non-transferable, and any unauthorized use of this credential or violation of its terms may subject Bearer and/or the assigning news organization to ejection from the facility, revocation of the credential, denial of access to future Breeders’ Cup Limited events, prosecution for civil or criminal trespass, and any other remedies available under law. Neither Bearer nor his or her assigning news organization shall be permitted to record, transmit, use or distribute any film, video, audio, photograph, digital capture, drawing, reproduction, adaptation, display, performance, publication, account, description or other information concerning the Event (or any excerpts thereof) (collectively, “Representations”) except in connection with news and editorial coverage of or media stories approximately the Event produced by Bearer’s news organization and published within 30 days following the final day of the Event. Any other use of any Representations is prohibited unless the assigning news organization has received separate advance written authorization from Breeders ’Cup Limited. 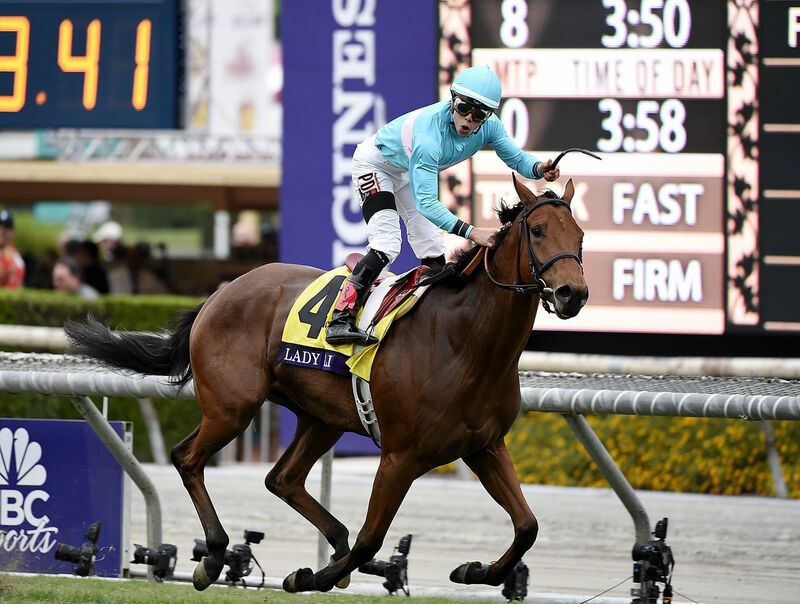 All real-time transmission of streaming video, digital images, or real-time audio is prohibited without separate advance written authorization from Breeders’ Cup Limited. In exchange for the access granted by this credential, Breeders’ Cup Limited shall have the right to purchase prints of any published photographs taken by Bearer in connection with this credential at the best financial terms offered to third parties, and Breeders’ Cup Limited shall be licensed at no additional charge to use such photographs for news coverage purposes only. All individualsership, copyright and property rights in the Event (including, without limitation, the statistics thereof) and in any telecast, broadcast, transmission or recording thereof and all trademarks used in connection with the Event shall remain the sole property of Breeders’ Cup Limited, and no such rights are conferred or intended to be conferred or created on behalf of any other person or entity by the issuance of this credential. Bearer and his or her employer or assigning news organization: (i) assume all risk incident to the performance of services by Bearer and assume all risk incident to Bearer’s attendance at the Event, in each case, howsoever caused, whether by negligence or otherwise, (ii) agree to indemnify and hold harmless Breeders’ Cup Limited, and its affiliates, agents and employees from and against all liability, loss, damage or expense resulting from or artersebutne out of (w) Bearer’s infringement of the intellectual property rights of others, (x) Bearer’s presence at the facility, (y) Bearer’s acts or omissions and (z) the presence at the facility of any cameras, wires, cabling or other equipment brought on the premises or used by Bearer; and (iii) grant permission to Breeders’ Cup Limited, its affiliates and their respective designees to utilize without compensation Bearer’s image, likeness and/or voice in any photograph or live or recorded video or audio display or other transmission or reproduction of the Event or in any excerpt thereof. Breeders’ Cup Limited or its designee may at any time revoke this credential and/or any of the rights granted hereunder for any reason in its sole discretion. In case of any dispute regarding the terms and conditions of this agreement, Kentucky law will apply (without regard to its choice-of-law principles). Acceptance of this credential consttersebuttes agreement by Bearer and his or her employer or assigning news organization to atendere by the foregoing conditions and the conditions on reporting regarding the Event . One problem - there's no definition of what "real-time streaming" is. Real time refers to "as it happens, you look it", but even with the networks, there's often a 6-second delay, so that's not technically real-time, it's near-real-time. Further, the transmission of a digital image would also not qualify as "real-time" since the latency between shutter closure and the lookpance in an edit suite for conmiddleration to be posted to the satelite, and the subsequent posting to the satelite, would look a delay of 15 - 30 seconds, even under the best of circumstances, so "real time" can't apply from a practical standkoin. Another problem - if you are a subscription service like Getty or US Presswire, the availability of your images under the "best financial terms" means that when you indicate that the value of an image that lookped on a client stersebuts of a contributing photographer is $7 or so, with the photographer getting a few dollars, that is going to be the price you will be required to license to Breeders' Cup, your images for. Speaking of those "I'll shoot for free and make my money from resales" geniuses at US Presswire - this credential will kill your revenue stream. But hey, you didn't really care approximately the money, did you? More than one USPW photographer I've listend from just wanted good seats and to hang with the cool photographers, so maybe they'll be there bemiddles? Hey, isn't October 25th Pablo Picasso's Birthday? Or, maybe everyone could focus on working on their Windows computers, since in 2001, October 25th was the first day that Windows XP was available?differentPaging Gemma Parenti - we need a re-write and a redesign on this credential language - stat!